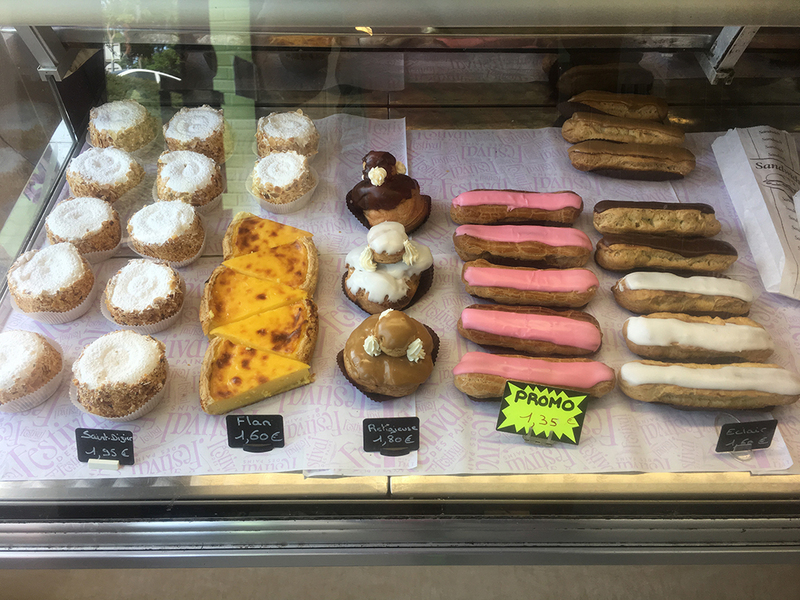 We rolled away from our hotel in Chamouilley around 10:30 am and stopped at the bakery at the edge of town to buy a sandwich and some pastries to take on the road. I don't know what it is about sandwiches from a French boulangerie that taste so much better than the ones I make even if I use the same ingredients, but even after this sandwich rode in my handlebar bag for 20 miles, it was one of the tastiest ham sandwiches I've ever had. It was only bread, butter and ham, but the French bread and the French butter are nothing like what I could find in the U.S., so I suppose that's the secret. Mamma arrived, smiled and confirmed that we had interpreted the newspaper headline correctly. We packed our goodies in our handlebar bags and rolled on down the trail. Today's route took us along the lateral canal of the Marne for the entire day. Occasionally we would see the River Marne off to our right, and once the canal even crossed over it. 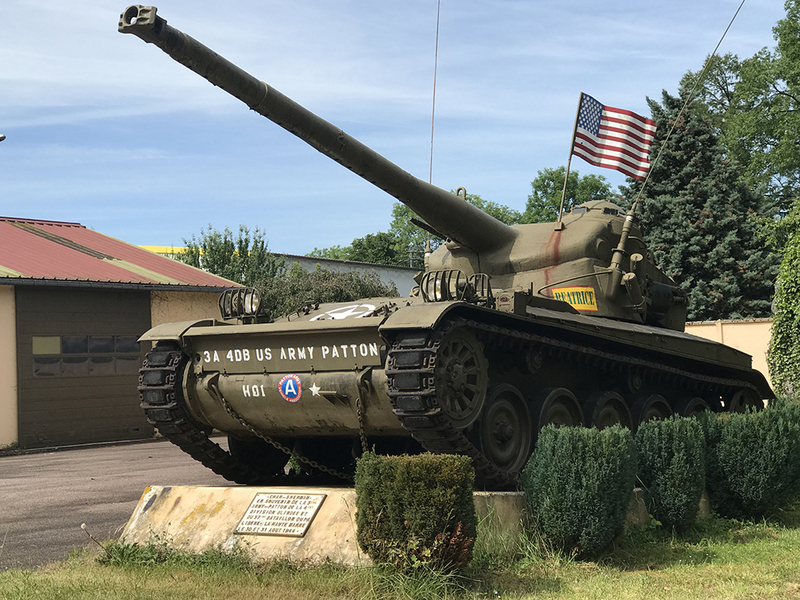 In the first little village we came to, Eurville-Bienville, we saw the Musèe Patton, acknowledging General George S. Patton's Third Army liberation of the Haute-Marne region in August 1944. A small Citröen tank sat in the front yard, and an American flag flew near the guard post at the gate. It did not appear to be open but we snapped photos of it through the fence. 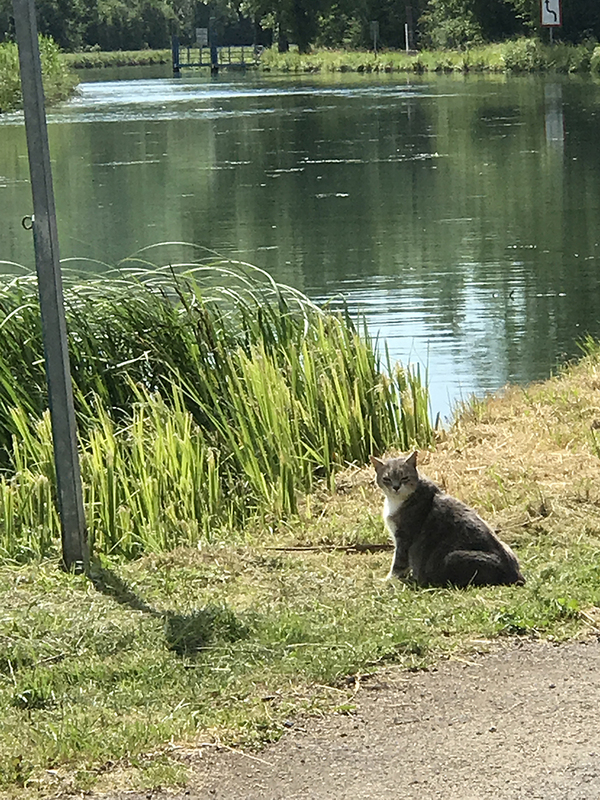 Riding along the canal, we have seen many people fishing but only today did we finally see someone catch a fish, and it appeared to be a small perch. It has been interesting to see the many different ways people set up their fishing spot for the day. Some just stand on the bank of the canal with long poles, but others have chairs and umbrellas (for the sun, today) and appear to be prepared to be there for the whole day. One fellow just pulled his jeep-like car so close to the bank of the canal that he could sit in the driver's seat and fish from the open door of his car. The terrain has changed from the long sloping hills of the Champagne region to open valleys, at times with steep wooded hills along either or both sides of the river. We have not seen vineyards for the last couple days, and the crops are mostly cornfields and a few wheat fields. There is plenty of pasture land with grazing cattle. The hills around us appear to be limestone, and we have seen an occasional quarry or two near the canal, with large mountains of stone crushed and ready for hauling. The trail is a very quiet place. We are far from car traffic -- though we can hear it on a highway off to the west of us, and the wooded areas of the trail bring us close to other sounds. We hear lots of singing birds, frogs, crickets and an occasional rooster. At one point, we heard a cuckoo. 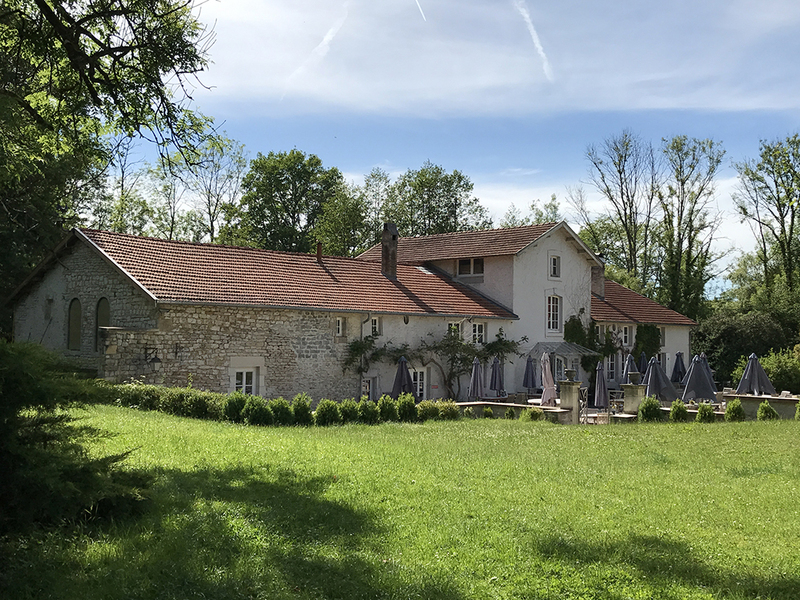 Otherwise, the tranquility of the valley is penetrated by the occasional sounds of the Dassault-Rafael jets of the French military conducting training flights overhead. There is not as much wind today, but the breeze that we do have -- about a 10 or 12 mph wind -- is in our face. In some spots along the trail we are sheltered somewhat by the trees, but in the more open valleys, the headwind is more apparent. 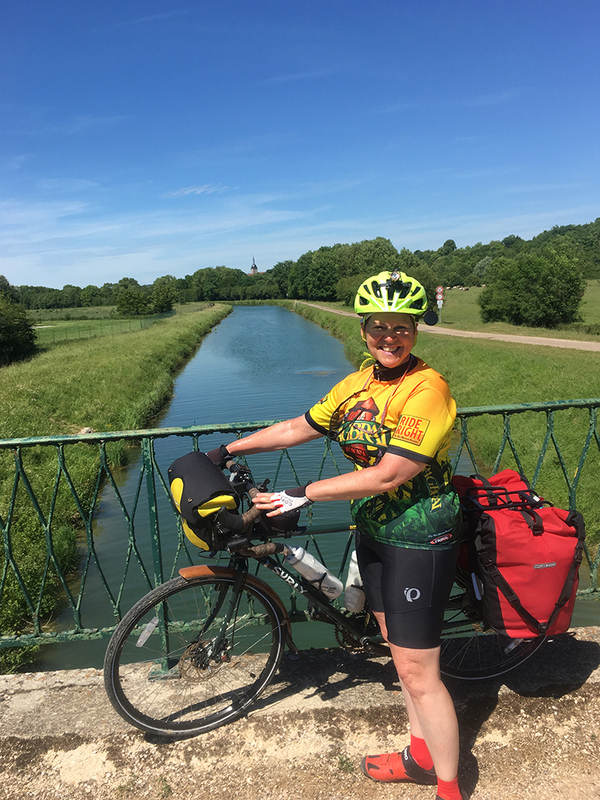 We have been climbing all day, but it is such a gradual climb that it is barely noticeable except for our less than stellar speed and the frequent locks on the canal. We are not moving very fast today and stopped several times to enjoy our sandwiches or pastry treats. The surface of the path is paved, and it was very smooth as far as Joinville but became a nubby asphalt surface after that. We saw more bicyclists and hikers/walkers on the trail today. We reached Joinville a little after noon and decided we could use a cup of coffee. We had plenty of time for the day's ride to our overnight spot at Gudmont-Villiers, so we rode in to Joinville and explored it a little. 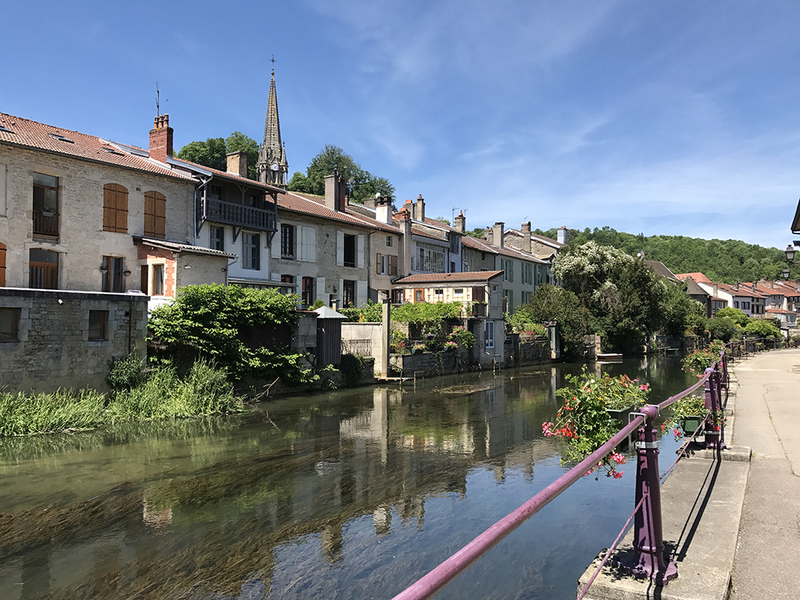 It has a pretty canal running through the middle of the town, and an old Gothic church halfway up the hill (but we could not find an open door to go inside.) High above the town are the ruins of some old walls along the top of the hill (old fortifications maybe?) but they did not look intriguing enough to compel us to climb the steep street to reach the panoramic viewpoint. After our coffee, we got back on the trail and pedaled toward Gudmont-Villiers. About 5 km from our B&B, we encountered a barge on the canal -- the first one we have seen in days. It was moving slowly upstream, so we decided to go wait for it at the next set of locks and watch it go through. While we sat on a bench in the shade, I ate my ham sandwich. We were moving slowly, but the barge was moving even slower -- probably about 1 or 2 mph. It was about 20 minutes before we saw it coming around the bend. As it crept nearer, the gates on the locks emitted a beeping noise and they began to swing open. The water and all the debris (moss, leaves, etc.) poured out and moved downstream. The barge slowly eased into the locks, with only a few inches to spare on each side. 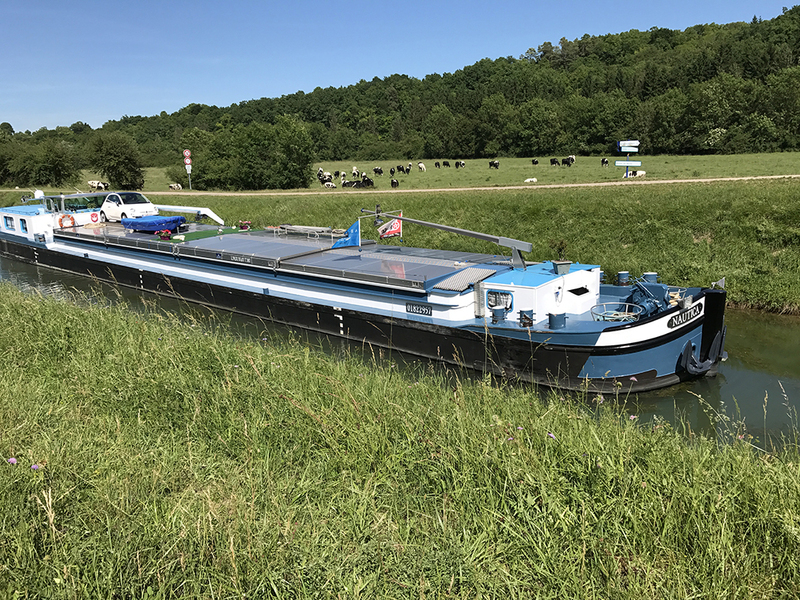 The tender waited as it rose slowly, and then he looped a rope around one of the tie-up spots so the barge would not move forward any further. As it was, the bow of the boat was close enough to the front gate of the locks that water pouring over the top of the gate was splashing on the deck. But as it rose, the boat escaped this waterfall, and the stream of water diminished, too, as more water came through under the gate. It did not take long to fill the lock and bring the boat up to the level of the upstream channel. The tender walked around the front of the boat with a mop and cleaned up the water that had fallen into the front area. He was from Belgium, which we could tell by the flag on the boat and by the language he was speaking when Steve asked him a question (does the boat always get water in the bow when going through the locks?) We weren't quite clear on the answer because I don't believe he understood the question. It appeared to be a two-person operation -- perhaps husband and wife -- with the woman on the bridge and the man handling the ropes and mopping. We wished them "bonne journèe." They understood that and smiled and waved. We reached La Source Bleue, our B&B in the country outside of Gudmont-Villiers, around 4:30 pm and were glad to get cool showers. It turned out to be a warm day, but our lodging is in the cool woods at the base of a forested hill. It is a quiet spot with a very popular restaurant, so we made sure to renew our request for a table at 7 pm. As we cooled down, we sat on the terrace outside our room. It faces a green hillside in the woods with a small pond at the base of the hill. We ordered drinks (Kir Royal for me and a Belgian blonde for Steve), and a young waiter came across the lawn with a tray, delivering the drinks to us on the terrace. After successfully figuring out the minimalist shower controls and getting cleaned up, we were ready for dinner. The innkeepper advised us that they were expecting a large group for the evening and that it would be good for us to arrive early for our table so we would not have to wait a long time. For dinner, Steve had a dish of perch (Sandre), and I had pigeon. 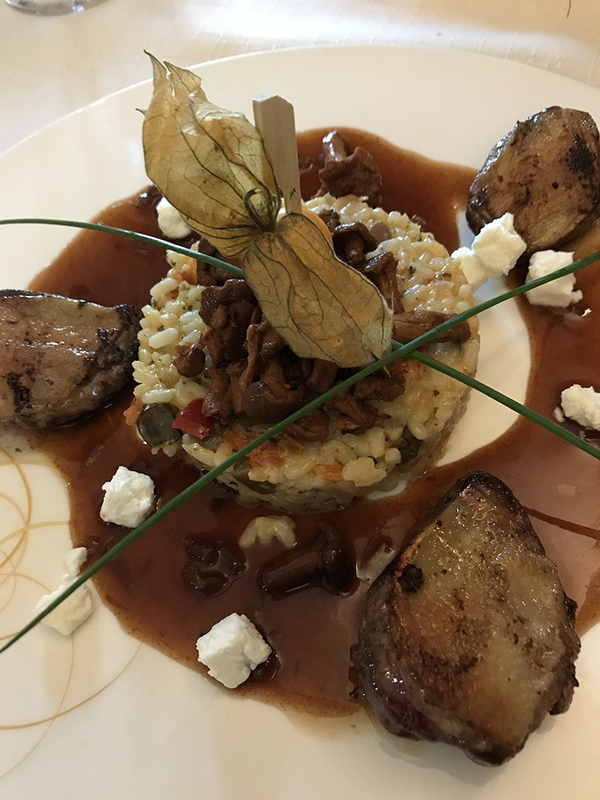 It's the first time I have eaten pigeon, and I did not realize that it could be so delicious. I would describe the taste as somewhere in the middle of the spectrum of the dark meat of turkey and a chicken liver. That may not sound like a good flavor to some, but I thought it was good. The more memorable part of my meal, though, was the appetizer -- a marinated piece of fresh salmon with flavors of lemon, dill, juniper, capers and perhaps a hit of a red peppercorn. It same with a nest of shredded celery (the European type of celery, which is more bulb than stalk) and crab pieces. We barely struggled through dessert, ended our dinner around 9:30 pm and trudged off to bed. Tomorrow's forecast is not favorable -- thunderstorms between 10 am and 3 pm. We have about 20 or 22 miles to ride to reach Chaumont. The egg baths on the breakfast bar require more than 3 minutes to fully cook an egg. Leave it in there about twice that long. There are fish in the Marne lateral canal.